Rangers at the Big South Fork National River and Recreation Area will be conducting free ranger-led programs almost every day this summer. The programs started Memorial Day weekend and will continue through Labor Day, and all you have to do to join is show up. Throughout the summer, rangers will be leading weekly hikes at Leatherwood Ford, Twin Arches, Oscar Blevins, East Rim Overlook, Sunset Overlook, Bandy Creek, Yahoo Falls, the Gentleman's Swimming Hole, and Charit Creek. Rangers will also be conducting 20-minute porch talks daily at the Bandy Creek Visitor Center and evening programs at the Blue Heron and Bandy Creek Campgrounds. To learn more about these programs, stop-by in any of the park's visitor centers, call the Bandy Creek Visitor Center at (423) 286-7275, or visit the BSF webpage. The Justin P. Wilson Cumberland Trail State Park announced yesterday that it has been awarded an AmeriCorps National Civilian Community Corps (NCCC) team to assist with trail construction in Campbell County. The seven-person Delta 4 Unit will work throughout the month of June alongside Tennessee State Parks work crews and community volunteers to extend the Cumberland Trail further toward Cumberland Gap. Project partners include the City of LaFollette and Jacksboro United Methodist Church. 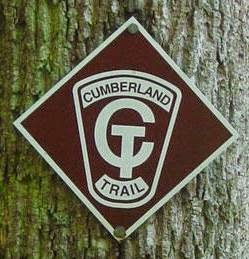 The Cumberland Trail State Scenic Trail is a backcountry hiking trail. It will extend, when complete, from a northern terminus at Cumberland Gap National Historical Park through 11 Tennessee counties and over more than 300 miles of scenic and historic terrain along the Cumberland Plateau before reaching its southern terminus at Signal Point in Signal Mountain. The Cumberland Trail connects 330,000 acres of some of the most biologically-rich, biodiverse and spectacular lands under public stewardship, including five State Natural Areas. Over 190 miles of trail are open for public enjoyment. AmeriCorps NCCC works to address the needs of local communities across the nation through team-based service projects. Project areas include disaster relief, environmental stewardship, energy conservation, infrastructure improvement, and urban and rural development. NCCC teams are comprised of young men and women who commit to performing 1,700 hours of service within a 10 month residential service term. Team members also perform individual service projects outside the scope of the team project to benefit the communities in which they are deployed. The Appalachian Trail Conservancy (ATC) invites volunteers, 18 and over, to help maintain the Appalachian Trail (A.T.) in the Great Smoky Mountains National Park as part of the Smokies Wilderness Elite Appalachian Trail (S.W.E.A.T) Crew for the 2014 season. These particular positions are physically demanding and are designed for experienced hikers who love to work hard, live in the backcountry and create lasting friendships. S.W.E.A.T. Crew is a mobile group that focuses on Trail maintenance in the heart of the Smokies on sections more than five miles from the nearest road. Crew members carry tools, water, food and camping supplies to support their work. Each session lasts six days in the field where the crew focuses on clearing the A.T. and repairing it with materials they find. Food, lodging, training, equipment and transportation to and from the work site is provided. "The Appalachian Trail Conservancy encourages all hikers and Appalachian Trail supporters to get involved with a Trail Crew," said Leanna Joyner, ATC's trail resource manager. "These all-volunteer crews are instrumental in completing large-scale projects along the Trail." Members of the S.W.E.A.T. Crew arrive at ATC base camp the day before their crew session begins to meet the professional crew leaders, prepare for the work trip and check out any gear they need. The next day the crew enjoys a family-style breakfast and loads up in an ATC vehicle and drives to a nearby trail-head in the Great Smoky Mountains National Park. After a challenging hike in, often up to 10 miles long while carrying a 50- to- 60 pound backpack, the crew establishes the campsite they will work out of for the next five days. The crew repairs, reconstructs and maintains some of the most isolated and stunning sections of the A.T., often working at elevations of more 6,000 feet. 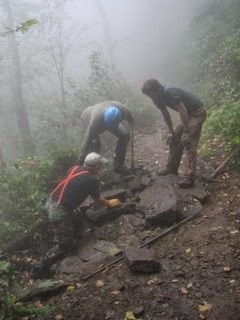 For more information about the ATC’s S.W.E.A.T Crew program or to volunteer, visit www.appalachiantrail.org/crews. That was John Muir’s reaction upon seeing the Paradise valley for the very first time in 1889. I dare say you might have the same reaction yourself. The best way to explore the Paradise valley below the southern slopes of Mt. Rainier is to hike the Skyline Trail loop. Below is a short video highlighting some of the amazing scenery you'll see on this hike. For more information on this outstanding hike, please click here to visit our new Discover the West website. Are Private, Illegal Trails Being Cut in Great Smoky Mountains National Park? "Sometime in recent years two trails running more than a mile-and-a-half were cut into the backcountry of Great Smoky Mountains National Park, allegedly for the use of a private resort that borders the park, according to court documents. When contacted by the Traveler, park officials declined to discuss the trails, or even acknowledge their existence, as their presence has been raised in litigation. 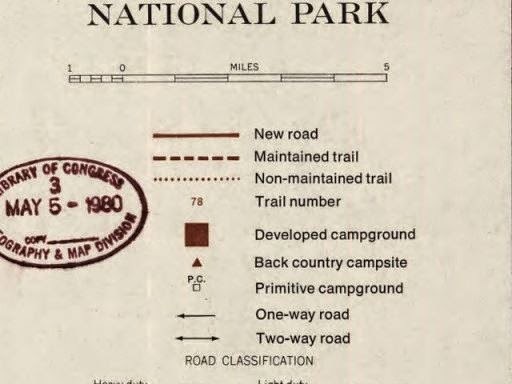 However, the "Boundary Trail" and "Blair Gap Trail" depicted on a trail map purportedly handed out by the Blackberry Farm Resort do not match any trails on the park's official trail map. Together they run along the park's western boundary roughly from the Beard Cane Trail to the Cane Creek Trail. The existence of the trails surfaced in connection with a lawsuit brought against the Park Service by Southern Forest Watch, a nonprofit group organized to overturn the park's $4 per night fee charged on backcountry travelers. Though not central to the fight over the backcountry reservation system, the group pointed to the "illegal trail system" as part of a pattern of "political patronage" that former park Superintendent Dale Ditmanson oversaw. Mr. Ditmanson, who instituted the backcountry fee system in 2013, retired from the Park Service earlier this year." "The boundary trail and blair gap trail is from the CCC days where they attempted to make an entire trail around the park boundary. It was more than likely routed from an old cherokee route. There are many trails in the park that are from ancient cherokee routes. They usually followed drainage's or mountain ridges, that were used for hunting and gathering. Portions of the AT is an example of a reclaimed cherokee trail. 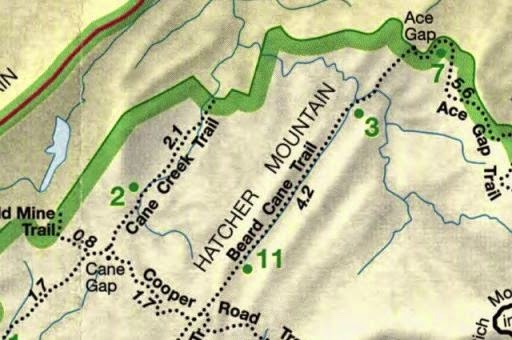 This extensive boundary trail is part of a series of trails (cove mountain, little greenbrier, roundtop, chestnut top, scott mountain, rich mountain and ace gap) and these trails are maintained by the park and are inside the park boundary." 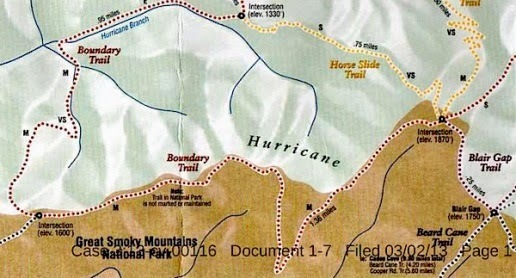 This information is supported by a document I found that discusses trail erosion patterns in the Smokies. This environmental research document was written by NPS employees, and was published sometime in the late 1970s. It discusses the Boundary Trail quite a bit. "came upon a trail of trees that had been chainsawed down. He and some friends also heard a chainsaw at work, and encountered riders on two all-terrain vehicles who allegedly claimed they had come from Blackberry Farm." I assume we'll all find out the truth of this matter once the Southern Forest Watch lawsuit against the NPS goes to trial. 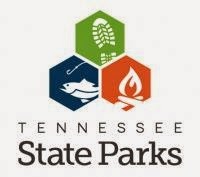 In conjunction with National Trails Day, Tennessee State Parks will host free, guided hikes on Saturday, June 7, encouraging outdoor enthusiasts to participate in several planned activities across the state. Each state park will host its own special hike, offering a variety of family-friendly activities including historical hikes, educational programming, re-enactments and wildlife watching. 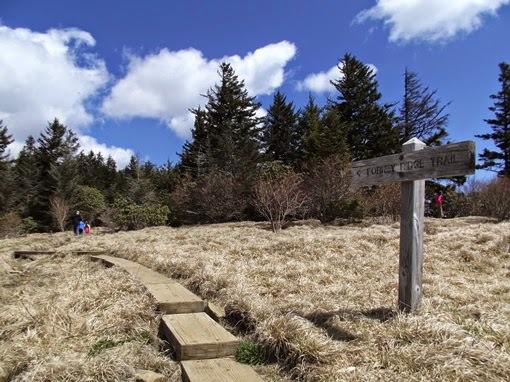 From Montgomery Bell to Roan Mountain to Reelfoot Lake and every state park in between, the National Trails Day hikes are designed for all ages and abilities. Some hikes will be approximately one mile in length and tailored for novice hikers, while others are lengthier and geared toward more experienced hikers. For a more in-depth look into planned National Trails Day events across the state, please click here. In addition to park hikes, the Tennessee Division of Natural Areas will host three hikes, including hikes at Devil’s Backbone State Natural Area, House Mountain State Natural Area and a Tennessee Coneflower tour. For more information on these hikes, click here. All events are scheduled for Saturday, June 7, and all times are local. Participants should bring water and food, and wear long pants and appropriate footwear. Some activities require reservations, so please call to ensure an opportunity to participate. 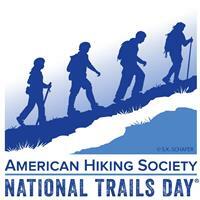 The upcoming National Trails Day hikes represent the third in a series of statewide hiking events for 2014. Additional statewide hiking events include First Hikes in early January, Spring Hikes in March, National Public Lands Day Hikes in September and an After-Thanksgiving Day Hike in November. The Tennessee celebration coincides with the American Hiking Society’s annual National Trails Day, which began in 1993 and is the largest single-day trails and outdoor celebration in the country. Thousands of people are expected to get outside and participate in events at local, state and national parks, forests and other public lands from coast to coast. It's almost June, which means mountain laurel will soon be blooming at the top of Spence Field. The hike to Spence Field out of Cades Cove is probably one of the most underrated hikes in the Smokies. I would go so far as to say that the combination of Spence Field and Rocky Top could rate as one of the top three hikes in the Great Smoky Mountains. Gregory Bald would definitely be included in that group, with Mt. LeConte via Alum Cave, Mt. Cammerer or maybe Charlies Bunion rounding out the top three. In addition to the outstanding views from Rocky Top anytime of the year, the mountain laurel at Spence Field makes this a special hike. The best time to tackle the 5.1-mile trek to Spence is usually right around mid-June when the grassy bald area is exploding with mountain laurel in peak bloom. Spence Field also provides for some outstanding views of the North Carolina side of the Smokies, but if you still have the energy, hike another 1.2 miles to Rocky Top for an even better vantage point - possibly the best in the park. For more information on Spence Field, please click here, and for more information on the hike to Rocky Top, please click here. If planning to make the pilgrimage to Spence Field or Rocky Top this season, you ought to make Townsend your headquarters. If you've never had the pleasure of staying in the Townsend area, known as the “Quiet Side of the Smokies”, you may want to note that it's much easier getting in and out of the park, and is fairly close to Cades Cove. If you need a rental cabin during your visit, be sure to visit our Townsend Accommodations page. The U.S. Forest Service plans to conduct a major trail renovation of the lower section of Trail #127 Black Mountain Trail from the intersection with Trail #603 Thrift Cove Loop in the Pisgah National Forest. This section of the Black Mountain Trail will be closed for at least two weeks, from May 28th to June 10, 2014. This project, in partnership with Pisgah Area SORBA, will help protect water quality, address erosion issues and overall sustainability of the trail. Public safety during this work is the number one concern. The public should avoid this area and heed all posted trail closed signs. For more information please contact the Pisgah Ranger District at 828-877-3350. As part of a National Trails Day celebration, the Big South Fork National River and Recreation Area will host a day of trail repair and clean-up on Saturday, June 7. The event will be held on the Middle Creek Nature Loop, and volunteers will meet at the parking area of the Middle Creek Nature Loop off Divide Road at 8:30 a.m. EDT. The Middle Creek Nature Loop was the first official trail built in Big South Fork National River and Recreation Area. Construction began on June 14, 1982. The National Park Service is partnering with the American Hiking Society on National Trails Day, a celebration that will bring together outdoor enthusiasts across the country on Saturday, June 7, 2014, for the 22nd annual celebration of America's magnificent trail system and its countless supporters and volunteers. More than 2,000 nationwide events will take place across the country including trail maintenance, hiking, paddling, biking, horseback riding, bird watching, running, trail celebrations and more! Since 1993, National Trails Day has inspired millions of individuals and community groups to take part in activities that promote healthy living and mental well-being, protect green space, educate youth and adults on the importance of trails, and instill excitement for the outdoors. For more information, call Effie Houston, Volunteer Coordinator, or Wally Linder, Trails Supervisor, at (423) 569-9778. With spring hiking season already in full gear, and summer just around the corner, you may be finding yourself in need of some new gear. If money's a little tight, you may want to check-out REI's current sale - which they're calling their "Biggest Sale of the Year". 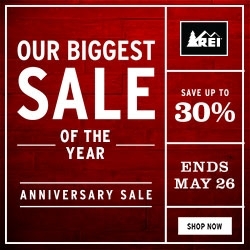 Thru May 26th REI will be offering up to 30% on a wide array of outdoor gear and apparel. REI members can also get an additional 20% off. Saturday, June 7, 2014, marks the American Hiking Society’s 22nd annual celebration of National Trails Day, which is America’s largest trail and outdoor celebration - a day devoted to appreciating America’s trails and the hard-working individuals who build and maintain them. In honor of this day, thousands of public events will be hosted nationwide and hundreds of thousands of trail enthusiasts will be outside as they hike, pedal, and paddle through some of America’s most beautiful areas. National Trails Day activities will occur in all 50 states, as well as the District of Columbia, Puerto Rico, and Canada. In 1987 President Ronald Reagan authorized the President's Commission on Americans Outdoors. The final report recommended that all Americans be able to go out their front doors, and within fifteen minutes, be on trails that wind through their cities or towns and bring them back without retracing steps. 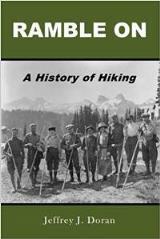 The recommendation, dubbed Trails for All Americans, became the impetus behind several public and private parties joining the American Hiking Society in launching the first National Trails Day in 1993. For a full list of events in your area, please click here. National Park Service Southeast Regional Director Stan Austin announced that Cindy MacLeod has been selected as the acting superintendent of Great Smoky Mountains National Park effective June 1. MacLeod is the superintendent of Independence National Historical Park in Philadelphia. She replaces Pedro Ramos who has been the acting superintendent since January. Ramos will return to his position as superintendent of Big Cypress National Preserve in Florida. “Cindy is an experienced superintendent and I know she will bring great leadership and energy to the Smokies until we complete the search for a permanent superintendent,” Austin said. MacLeod began her career with the National Park Service in Michigan in 1980 as an architectural historian. She worked in the National Park Service regional offices in Omaha, Neb., and in Philadelphia. She served in international assignments in Poland and France. Prior to joining Independence National Historical Park, she was superintendent of Richmond National Battlefield Park and Maggie L. Walker National Historic Site, in Virginia. MacLeod has a master’s degree in architectural history from the University of Virginia and a bachelor's degree from Duke University, where she majored in both zoology and comparative literature. She completed Harvard University’s Senior Managers in Government Program and the Senior Executive Service training program. She is married to architect Douglas Harnsberger, and they have two children. On September 3, 2014, Rocky Mountain National Park will kick off its year-long 100th Anniversary celebration. Honor the past, inspire the future, and celebrate the present wilderness, wildlife and wonder with this new video from the park! If you plan to visit Rocky Mountain National Park during the centennial celebration, or anytime this year, please note that our hiking website for the park offers a wide variety of accommodation listings in both Estes Park and Grand Lake. Also, don't forget to check out our other Things To Do page to also help with your trip planning. Over the past couple of years I've had the opportunity to review several books concerning mountaineering in the Himalayas. Although the subject matter may be slightly off the normal topic for this blog, you may want give this one a closer look. Tempting The Throne Room is a new book written by local adventurer, John Quillen, from Knoxville. In addition to reaching the summits of big mountains around the world, John has hiked all 900 miles of trails in the Great Smoky Mountains. He's also been the leading voice in the fight against the controversial implementation of backcountry fees within the park. 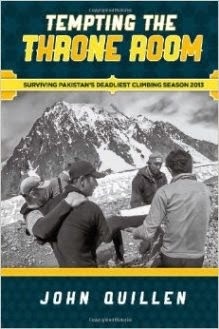 Tempting the Throne Room: Surviving Pakistan's Deadliest Climbing Season 2013 chronicles John's ill-fated expedition to 26,414-foot Broad Peak, the 12th highest mountain in the world, located in the Karakoram Mountain Range of the Pakistani Himalayas. In 2013 a total of 21 climbers died in the Karakoram - the highest number of casualties ever in one season in Pakistan. Six of those climbers were associated with Quillen's expedition. During the acclimatization process John's hiking partner shattered his leg while descending from Camp 1 - at an elevation of roughly 18,000 feet. What ensued was a fairly complicated rescue mission to get his partner down to base camp, and then off the mountain completely. Forebodingly, this event would prove to be an omen of what was to come for the expedition. Quillen also goes into great detail on the intricacies and realities of what happens once you arrive "in-country", as well as on the multi-day trek to base camp. I really appreciated this "behind the scenes" look at the messy process of getting proper permits, the terrifying drive along the Karakoram Highway, as well as the many travel issues associated with the 100-mile trek to base camp. Along the route the team learned of the 11 climbers on Nanga Parbat who were murdered by Taliban terrorists disguised as police. Not far from their own location on the road to Broad Peak, the Taliban casually walked into base camp and executed the multinational team of mountaineers. Quillen's own group passed checkpoints where soldiers were dressed in jump suits and gold chains. Though this was apparently normal, John couldn't help but suspect that they may have been Taliban just as well. All in all I thought this was a solid accounting of the tragedies on Broad Peak last year. I thought what made this book stand out was John's retelling of his own experiences along the route to Broad Peak, the glimpse he provided into the realities of life in base camp, and his role in the rescue of his climbing partner. Tempting The Throne Room is now available at Amazon. You can also find additional information at www.temptingthethroneroom.com. Share the Experience Photo Contest is Back! The 2014 Share the Experience Photo Contest is now accepting entries through December 31, 2014. If you’re an amateur photographer, this is your chance to submit your inspiring images of America’s federal lands, national parks, forests, waterways and historical sites. The 2014 contest features many prizes and a brand new submission category – Night Skies. Share the Experience showcases amazing photography that highlights the endless recreation opportunities and breathtaking scenery offered by our federal lands. In 2013 about 18,000 images were submitted. You can a complete list of 2013 winners and honorable mentions by clicking here. Will you be the next winner? The 2014 Grand Prize package includes $10,000, and the winning image will be featured on the 2016 America the Beautiful - The National Parks and Federal Recreational Lands Pass. For a full listing of prizes and rules, or to submit a photo, please click here. Participating Federal Agencies include: National Park Service, U.S. Bureau of Land Management, U.S. Bureau of Reclamation, U.S. Fish and Wildlife Service and U.S. Forest Service. You can also visit www.sharetheexperience.org to view amazing photos and weekly winners, vote for favorites, and submit your entries. The National Park Service announced yesterday that Valor Awards were given to 17 employees who have demonstrated unusual courage in the face of danger. In a ceremony on Thursday, Secretary of the Interior Sally Jewell presented the Valor Awards to the employees, as well as the Citizen’s Award for Bravery to three private citizens who risked their lives to save others while on Department of the Interior lands. This included two men associated with the Great Smoky Mountains National Park. Bradley Griest, a park ranger at Great Smoky Mountains National Park, and Christopher Scarbrough, a volunteer with the Town of Townsend Fire Department, rescued a barely conscious motorist trapped in a partially submerged vehicle in the Little River. They winched open the door against the strong current, freed the driver, secured him to a litter, and lifted him up a steep embankment to an ambulance. You can read the full list of all recipients by clicking here. Great Smoky Mountains National Park firefighters are managing a low-intensity, 10-acre wildfire, located just above Rainbow Falls along the Rainbow Falls Trail. The Rocky Spur fire was reported at approximately 9:30 p.m. on Thursday, May 8th by a small aircraft. Firefighters were on scene this morning and will remain in the area to monitor the spread of the fire which lies within a natural fire zone. No resources, including structures at Mt. LeConte, are threatened by the fire. The fire is slowly spreading, with flame lengths less than 3 feet high, through a pine-oak forest including a fire-dependent Table Mountain Pine stand. Firefighters anticipate that the fire will stay confined to the Rocky Spur area due to non-receptive fire fuels across the ridge along with predicted rain. The cause of the fire is under investigation. Rainbow Falls Trail has been closed to all use. For more information regarding the park's wildland fire management program, please click here. U.S. Forest Service firefighters continue to suppress a small wildfire in the Harmon Den area of the Pisgah National Forest. The wildfire, reported late Wednesday afternoon, is 60 acres in size, and is under investigation. Nearly 30 firefighters and others are working to suppress the wildfire. Containment lines have been established and back-burning operations have been completed. Firefighters will continue monitoring and improving containment lines, while minimal smoke is expected today. Resources include the Asheville Hotshots and other firefighters, several local engines, and a Forest Service helicopter from Georgia. The Max Patch parking area is open to the public, however, the following areas remained closed because of firefighting activities: Cold Springs Rd. (Forest Service Road 148); Browns Gap Rd. (FSR 148A); and Harmon Den Campground. These areas may reopen on Saturday afternoon. 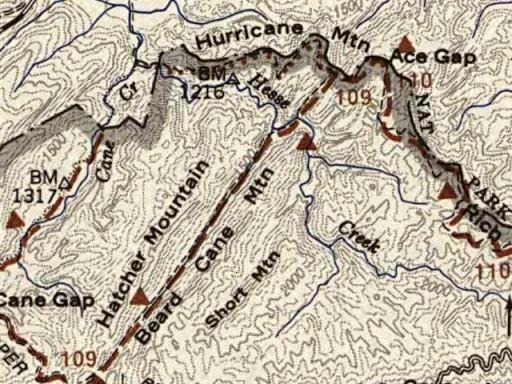 Time to Make Plans for Gregory Bald! Although Gregory Bald is an excellent destination anytime of the year, mid to late June is the absolute best time to make the trek to the summit. In addition to its excellent views into Cades Cove, Gregory Bald provides for one of the best flame azalea shows in the world during this time frame. In fact, azalea lovers from all over the world come here to visit perhaps the finest display of flame azaleas anywhere on the planet. According to the Great Smoky Mountains Natural History Association, the various hybrids of azaleas on Gregory Bald are so impressive and unique that the British Museum of Natural History has collected samples of them. This isn't an easy hike, however, the Gregory Ridge Trail climbs over 3000 feet, and the roundtrip hike is 11.3 miles. But it's well worth it! 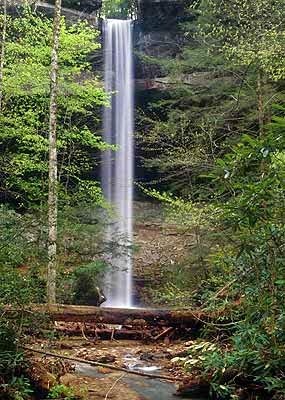 As mentioned on this blog in the past, I would definitely rate this as one of the top 3 hikes in the Smokies. For more information on this outstanding hike, please click here. If planning to make the pilgrimage to Gregory Bald this season, you should consider making Townsend your base of operations. If you've never had the pleasure of staying in the Townsend area, also known as the “Quiet Side of the Smokies”, you may want to note that it's much easier getting in and out of the park, and is fairly close to Cades Cove. If you need a rental cabin during your visit, be sure to visit our Townsend Accommodations page. A contractor for Great Smoky Mountains National Park will perform striping operations in TN beginning Monday, May 5th through Thursday, May 22nd along the Spur, Little River Road from Sugarlands Visitor Center to Townsend, the top two miles of Newfound Gap, and the Elkmont entrance road. Operations will be completed between 7:00 a.m. and 12:00 a.m. on Monday through Thursday. Weather delays due to rain could cause the project to continue beyond May 22nd. During the operation, traffic will be reduced to one lane for short sections. Motorists should use caution when they encounter the road striping operations and pay close attention to traffic control devices along the roadway. 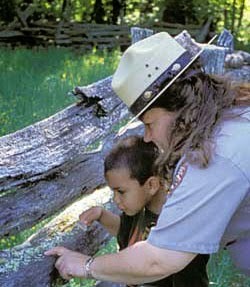 Great Smoky Mountains National Park invites students, recent graduates, and their families to participate in a National Park Career Day on Saturday, May 10, 2014, from 9:30 a.m. until 2:30 p.m. where students will receive a behind-the-scenes look into National Park Service careers. Park employees will lead hands-on activities that best demonstrate their job duties, while also providing career planning advice. Students will experience careers such as wildlife management, vegetation management, law enforcement, fire management, education, archaeology, fisheries management, engineering, and facility management. Participants will also have a special opportunity to connect with Grand Canyon National Park via Skype to learn about careers in other National Parks. High School and college students are invited to participate individually or with their families. Middle school students are invited to participate, but parent participation is required. All participants should meet on the front porch of Park Headquarters at 9:30 a.m. which is located behind Sugarlands Visitor Center approximately 2 miles south of Gatlinburg, TN on Newfound Gap Road. Participants should be prepared to be outside for the entire Career Day with long pants, sturdy shoes, layered clothing, rain gear, lunch, and a notebook. The event will be held rain or shine. If you are unable to attend this event, we also offer monthly Student Volunteer Days which are geared towards giving students a chance to help the park by working on a real science or service project. These Student Volunteer Days also benefit the student by giving them real experience to put on their resume and count towards service hours. For any questions about this event, please contact Park Ranger Emily Guss at 865-436-1713. Next weekend, on May 16th though May 18th, Damascus, Virginia will hold its annual Trail Days festival. Trail Days is the annual Woodstock for hikers. It’s the mother of all hiking gatherings. It’s a celebration of all things Appalachian Trail. And it all happens in tiny Damascus, also known as Trail Town, USA where the Appalachian Trail, the Virginia Creeper and the Iron Mountain Trail slice through the middle of town. Each year Damascus becomes the destination point for thousands of thru-hikers, veteran hikers and those who just love hiking and the Appalachian Trail. It's recognized as the largest trail event in the world, and many A.T. thru-hikers will time their hike in order to be in town in mid-May for the annual three day festival. Trail Days Documentary from thebackpackertv on Vimeo. Trail Days 2014 will happen on May 16-18 this year. For more information on the event, please click here. I've never been to Trail Days, but I have been to Damascus a couple of times, and found it to be a very cool little town. I should also mention that the hike to Mt. Rogers, not far from town, is one of my all time favorite hikes. Blue Ridge Parkway Superintendent Mark Woods is pleased to announce that a section of the Parkway from Milepost 376 at Ox Creek Road to Milepost 355, near the entrance to Mt. Mitchell State Park, is once again open for travel.This popular stretch of motor road was closed for stabilization work on a failed slope just north of Tanbark Ridge Tunnel at Milepost 374, the site of last summer's well-known "crack." With this repair project complete approximately three weeks ahead of schedule, all 469 miles of Parkway motor road are now open for visitor access and enjoyment.The popular Craggy Gardens Picnic Area and Visitor Center, at Milepost 364, which had been closed during this repair project, will open May 9, 2014, along with the majority of other Parkway facilities reopening for the season on that date. The full schedule of 2014 seasonal openings and visitor services along the Blue Ridge Parkway is available at www.nps.gov/blri.